Running a fleet maintenance department can be a thankless job. Many fleets look at maintenance as a non-revenue-generating – albeit necessary – expense, while drivers often think the department is out to get them with every breakdown. 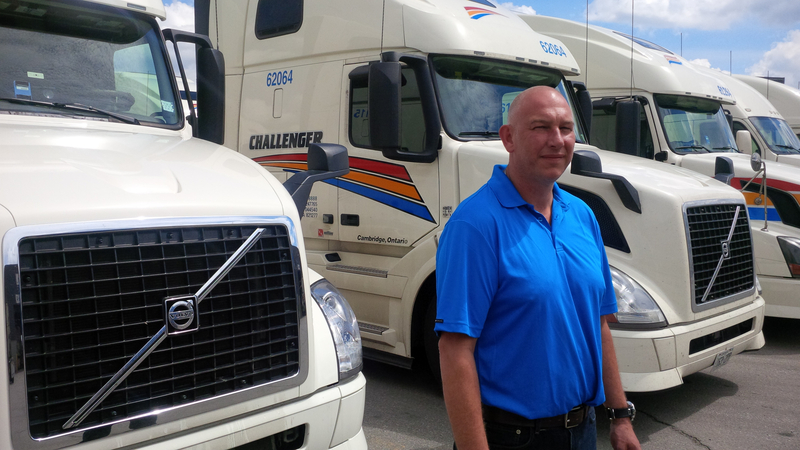 However, Chris Iveson, the 2015 Canadian Fleet Maintenance Manager of the Year, has fostered a strong relationship with drivers at Challenger Motor Freight, by looking at them as his department’s customers. Iveson oversees more than 150 staff and 4,500 pieces of equipment across Challenger’s network of four maintenance facilities. He actively promotes the profession, which should come as no surprise given his own background. Iveson’s first job fixing trucks came soon after completing high school, completing an apprenticeship at a local Esso station. “I worked my way through my apprenticeship and once I got my licence, I very quickly got into management. I became a service manager probably two years after I had my licence and shortly after that I bought my first service station. I had bays and fixed cars and had mechanics working for me,” Iveson recalled. Meanwhile, his father was a truck driver and so it often fell on the younger Iveson to repair his truck on evenings and weekends. Iveson had mixed results as business owner, and eventually joined Challenger in 2008, but while he never became a service station tycoon, the experience of running his own business is invaluable today. Managing a fleet as diverse and geographically scattered as Challenger’s isn’t easy. The company operates across North America with multiple divisions hauling everything from wind turbines to trash, to general freight and now even gravel. The inconsistent service levels Challenger has experienced make it all the more important to do as much preventive maintenance as possible at its own facilities. Speaking of home, Challenger’s Cambridge shop is treated as such. It’s about 10 years old now but looks newer. It’s brightly lit, clean-swept and obsessive compulsively organized. This is something Iveson clearly takes pride in as he gives me a tour, pointing out how each tool has a clearly labeled spot where it’s been strategically housed to reduce the time technicians spend trying to find things. Iveson interacts easily with technicians and says he tries to spend at least two hours per shift on the shop floor so he’s attuned to issues his staff is dealing with. Finding and keeping technicians is a struggle, Iveson admits, but his tireless advocacy and outreach with local schools has resulted in a steady supply of apprentices. He has found success in attracting experienced techicians by reaching out via social media. Iveson has discovered that bringing trucks and equipment to local schools – or inviting students to visit Challenger’s shop – has resonated with budding technicians and often sparks an interest in pursuing a career there. Once he’s drawn in aspiring young technicians, Iveson said it’s equally important to keep them engaged. Doing so requires a softer touch than in the past. The ability to change and adapt has become an essential skill for technicians, as the pace of technological change has accelerated. Trucks have never been so complex and in recent years new technologies have brought with them myriad challenges in the shop. Iveson, however, relishes the challenges new technology has spawned. Iveson also welcomes the new generation remote diagnostic capabilities, which can help him monitor the health of the fleet from anywhere. Iveson is acutely aware that keeping trucks operational not only improves the company’s productivity, but also helps it keep drivers satisfied. This is also why he involves drivers in the spec’ing process when new trucks are being ordered. “We’ve really evolved our process, and look at the truck spec’ we bring in as a tool for retention of our drivers,” Iveson said. The new procedure has also resulted in a different mix of trucks coming into the fleet. Challenger has recently placed orders for more than 100 Volvos with bigger bunks than was previously spec’d, 187 Freightliner Cascadias, 20 Kenworths and, for the first time, 80 Peterbilts. Some of those selections were clearly made with driver feedback in mind. So with drivers being included in the spec’ing process – and treated to maintenance-sponsored barbecues – does that mean they give back to the maintenance department by taking greater care of their vehicles?